The LED is possibly the simplest actuator available. It’s a low power light source available in many colors. It lights up when powered from an Arduino pin. Input: Arduino provides a maximum of 40 mA per pin; this is enough to light up the LED through the digitalWrite() and analogWrite() functions. 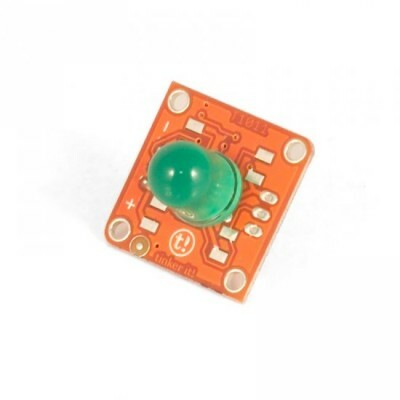 This module features a 10mm Green Light Emitting Diode, the standard TinkerKit 3pin connector and a green LED that signals that the module is correctly powered and a tiny yellow LED that shows the current brightness of the large green LED. A resistor provides the optimal amount of current when connected to an Arduino. This module is an ACTUATOR therefore the connector is an INPUT that need to be connected to one of the OUTPUT connectors on the TinkerKit Shield.